One time, when this tree was maintained, it lived, and was beautiful. As time goes, the humans that tended this tree died, moved on, found other interests, and so the tree was left in the desert where it had been placed by men. It was left to die. And so it died. One weekday, I had a hair to drive to Gila Bend and see an old motel. I found this tree, and reveled in its continued beauty. But, it is, indeed, a shadow of itself. 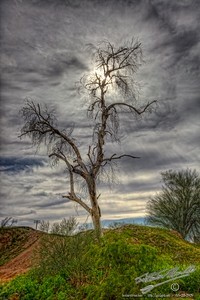 This entry was posted in Desert, Flora, Landscape, Lovely Light, Memorial, Nature, Painterly, Purchasable - As Art Prints. Bookmark the permalink.